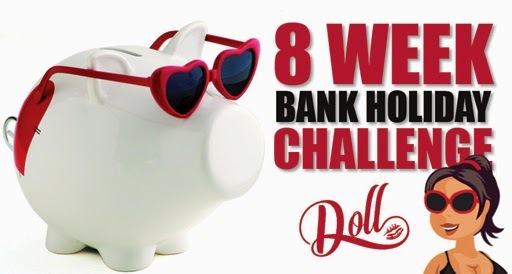 The Skinny Doll: Bank Holiday Challenge! I'm in too please. Going on hols 5th June. Need motivation and a kick!!!! Defo in! I need to loose - not lost any since Christmas - I was hoping to loose another stone by now as it's my sister's wedding next weekend but i've not gained :) Just been up and then down again :( Oh well! Let's move on to the future - going away over Easter and I'm starting to train for Race for Life in Bath in June so a good target!! I am definitely signing up for this. I had started working with a personal trainer in the past couple of weeks, but unfortunately his son is ill so he has had to drop me as a client. I'm rejoining Weight Watchers in the next week so it'll be great to have this to spur me on! Hey Doll, my friend is with a fab personal trainer in Sandyford, if you are interested I can ask for his details? Third time lucky!! Not posted before and wasn't signed in! Count me in...defo need something to motivate me!! Yay I'm in. Let's do it! I am in! Not doing weight watchers but a low GI diet at the moment (bit of a lifestyle change was needed) but I would like to do the challenge too as I need to get myself exercising again!! Count me in ...going to Paris on the 9 th of May so thats good motivation to lose that last ten pounds!